Rare map of Luzon issued in Manila at the outbreak of the Philippine-American War. 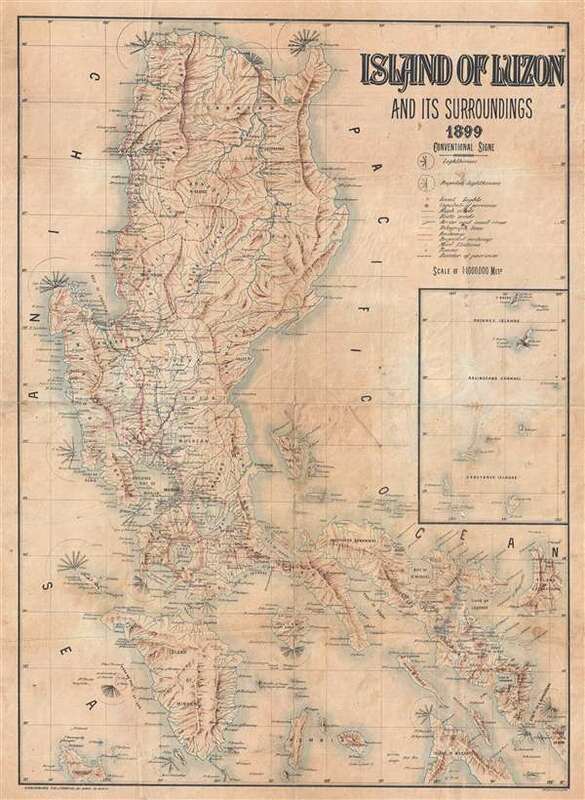 Island of Luzon and its Surroundings 1899. An extremely rare 1899 map of the Island of Luzon in the Philippines issued at the outbreak of the Philippine-American War. The map covers all of Luzon as well as some of the nearby islands including Mindoro, Boracay, Burias, and others. Topography is rendered with shading. The location so of lighthouses and projected lighthouses are also noted. Red overprinting identifies the locations of railroads, roads, mail stations, projected railways, lesser lighthouses, and mail stations. This map was published in Manila by Francisco J. de Gamoneda and the Establemiento Tipo-Lithografico del Diaro de Manila. Francisco J. de Gamoneda (fl. c. 1898 – 1913) was a map publisher active in Manila, the Philippines, in the late 19th and early 20th centuries. He is credited with an exceptional 1898 map of Manila and a 1899 map of Luzon. Average. Map exhibits overall toning and some soiling. Wear along original fold lines. Minor manuscript annotation.